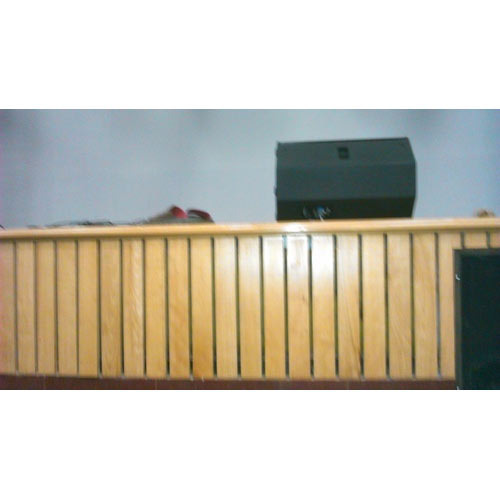 We are a leading Manufacturer of Wooden Paneling, Acoustic Louvers, Acoustic Windows, Noise Testing Booth, Sound Proof Acoustic Enclosures and Heavy Machine Acoustic Enclosure from Noida, India. Backed by our rich industry experience in this domain, we are engaged in offering the wide assortment of Wooden Paneling. This paneling has some unique features like sturdiness, termite resistance, etc. The offered paneling is manufactured and designed with the help of supreme grade wood and advanced tools in adherence to set industry standards. The provided paneling is highly admired in the market by our patrons owing to its modern look and durability. We specialize in offering quality Acoustic Louvers, which meets the variegated requirements of the clientele. These are mainly employed at the side of entry or air exhaust. These are proved to be the best devices for reducing sound to the maximum. Available in various sizes, these are customized according to the client’s requirements. Further, these are available at cost effective prices. To meet variegated demands of our clients, we are engaged in offering an exclusive range of Acoustic Windows. The offered window is precisely manufactured under the supervision of dexterous professionals using premium grade material and ultra-modern techniques as per the set industry standards at our well-equipped production house. In addition to this, the provided window is made available in innovative designs and patterns to fulfill the preferences of our clients. We offer Noise Testing Booth to test each & every piece of product. These booths are designed with perfection, accuracy & new technology. The primary function of this booth is to control the shop floor noise and increase the accuracy of intensity measurement by reducing sound reflections. Our organization has established his name in the industry with experience and expertise in offering Sound Proof Acoustic Enclosures to our clients. These Sound Proof Acoustic Enclosures employ noise blocking curtains and are well rated on account of their excellent functionality and accurate dimensions. We provide Heavy Machine Acoustic Enclosure which is designed with perfection and accuracy to each and every intricate detail. Even the minutest of a specification is paid due attention while producing these so that the flawless can easily be provided to the client.